Santa Monica is nestled just along the coast from Los Angeles on the Pacific Coast Highway. For some classic Californian beach vibes, shopping and a vibrant nightlife it is the perfect stop off at the end of the iconic Route 66. Miles of golden sandy beaches, hotels within walking distance of Santa Monica’s main attractions and restaurants serving up delicious local Californian cuisine. It may be the ‘End of the Trail’ but your holiday doesn’t need to end there. After road tripping across the country, Santa Monica ticks all the boxes for a relaxing final stop, chill out on the beach while surfers catch waves, stroll along the famous pier and take a ride on the iconic Ferris wheel. Stop by the renowned Muscle Beach, the outdoor gym is a favourite with the locals. 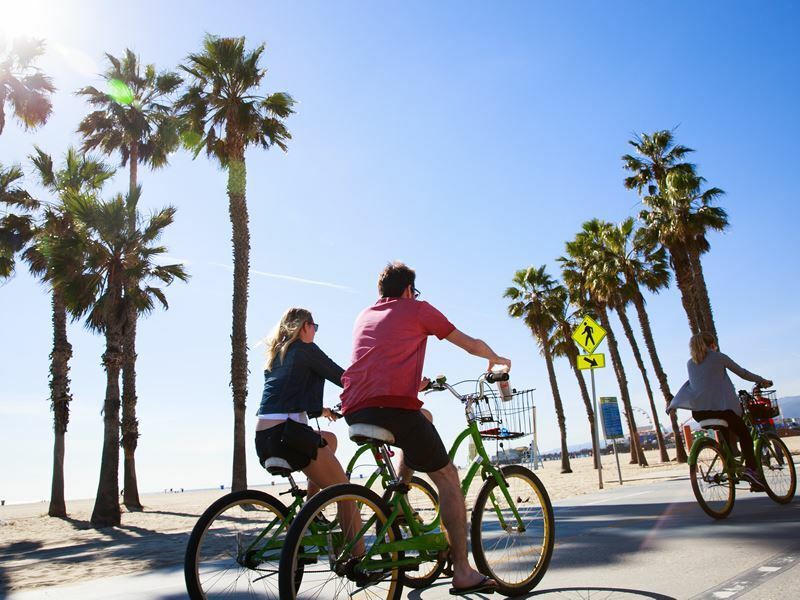 Hire a bike and cruise along the ‘The Strand’ the bike trail meanders along the oceanfront passing colourful beach houses and continues for around 22 miles. Get your shopping fix in Santa Monica too, what better way to end a holiday then with a bit of self-indulgence. Third Street Promenade is a pedestrianised shopping area stretching for three blocks, window shop, splash your cash and watch street performers in this bustling neighbourhood just a short walk from the beach. Montana Avenue has boutique stores galore and over 100 shops in total making it a shopaholics dream. Santa Monica Place features designer stores such as Tiffany & Co and Louis Vuitton and don’t forget to look out for one of the many farmers market selling local produce and artisan products. For a spot of culture Bergamot Station is the area to visit for art galleries, the disused train depot features around 35 local artists. Watch the sun go down in style over the Pacific Ocean at rooftop bar ONYX and choose a beachside restaurant for oceanside dining. Take a stroll in Palisades Park, feel the warm sea breeze and take in the cliff top ocean views from this peaceful space. Particularly spectacular at sunset this park is wonderful for relaxing walks and people watching. If you feel like exploring a little further afield, Santa Monica is in close proximity to downtown LA, Hollywood and Beverly Hills. Beverly Hills with its classy shopping on Rodeo Drive and famous residents is only 7 miles away, Los Angeles and Hollywood are 15 miles away so it’s easy to spend the day spotting stars names along the Hollywood walk of fame and capturing photos of the Hollywood sign from the lovely Griffith Park. From here there are also splendid views of downtown LA. However you choose to spend your time there are plenty of things to do in Santa Monica. Santa Monica has a huge variety of eateries and is famous for being the forerunner of ‘California Fusion’, incorporating a stylish culinary blend with local produce. There are a lot of healthy eating options which compliment Santa Monica’s outdoor lifestyle and many restaurants strive to use organic ingredients from local farmers markets. There are also plenty of options for those with dietary preferences. If you fancy indulging in a burger or naughty dessert you will find that in Santa Monica too. 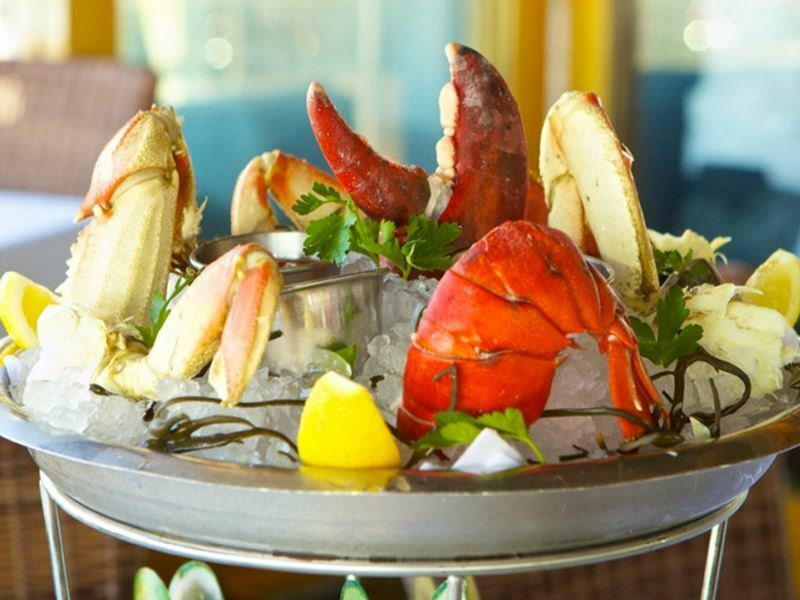 If you like seafood then The Lobster is the restaurant to visit, found at the entrance of the pier with outdoor dining and beautiful views of the ocean. It’s a fantastic place to watch the sunset from and at night the pier and Ferris wheel look magical all lit up. As the name suggests lobster is a must have here, grilled or steamed and paired with a good wine this restaurant makes for a special end of holiday treat. From sushi and burgers to steak and salmon, Hillstone has something for everyone. Upmarket but with a laid back feel it’s the perfect lunch stop in between shopping on Third Street Promenade or for an evening meal with a buzzing atmosphere. Its worth noting that Hillstone does not take reservations so be prepared to queue at busier times. Downtown on Third Street and a short walk from the pier, True Food Kitchen is a heavenly all round treat, featuring a healthy mix of Mediterranean and Asian fusion cuisine. The laid back vibes and an open kitchen make you want to stay all day. From organic to gluten free and vegan, whatever your food preference this place can cater for it. Freshly pressed juices, local beers and cocktails along with a seasonal menu and an exciting brunch menu make True Food an option for any time of the day. Try the Cranberry and Pomegranate Mimosa for a treat with brunch. 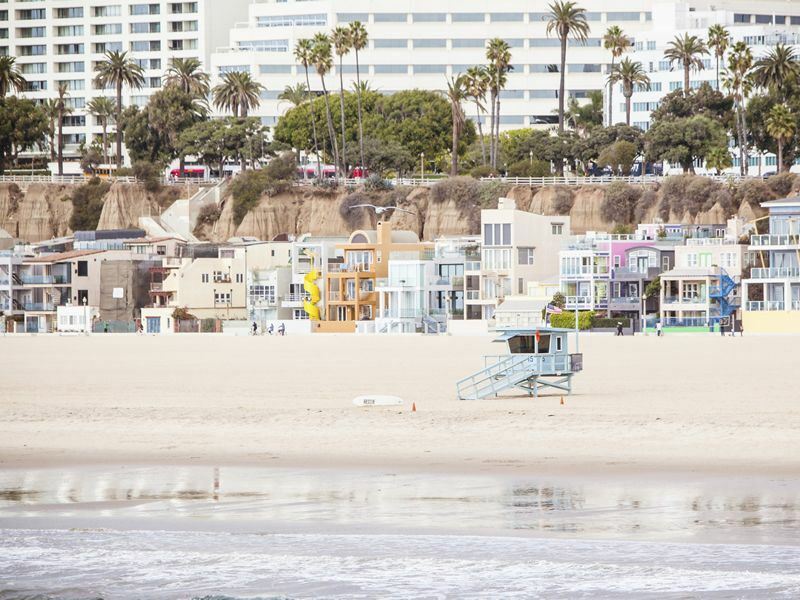 There are plenty of options when it comes to accommodation in Santa Monica from hotels on the beach to boutique hotels nestled in a quiet neighbourhood. What’s more, many of the downtown or beachfront hotels are within walking distance of the pier and shops so you can quite easily get around without a car be it on foot, by bike or public transport. Wherever you choose you can’t go too wrong in this oceanside town. Right on the sand, Shutters on the Beach will knock your socks off, luxurious and effortlessly chic it has everything you need to end a holiday in style. Ocean facing rooms, a pool deck with glorious views of the beach, a spa for relaxing, plus yoga on the beach or surf lessons for those wanting to seek out adventure are perfect little add ons. Do as much or as little here, the choice is yours. Visit the hotel beach bar and café, Coast for a snack or sun downer with uninterrupted sea views or head to 1 Pico for a delightful dinner with glass of wine or two and finish with a night cap in the Living Room. 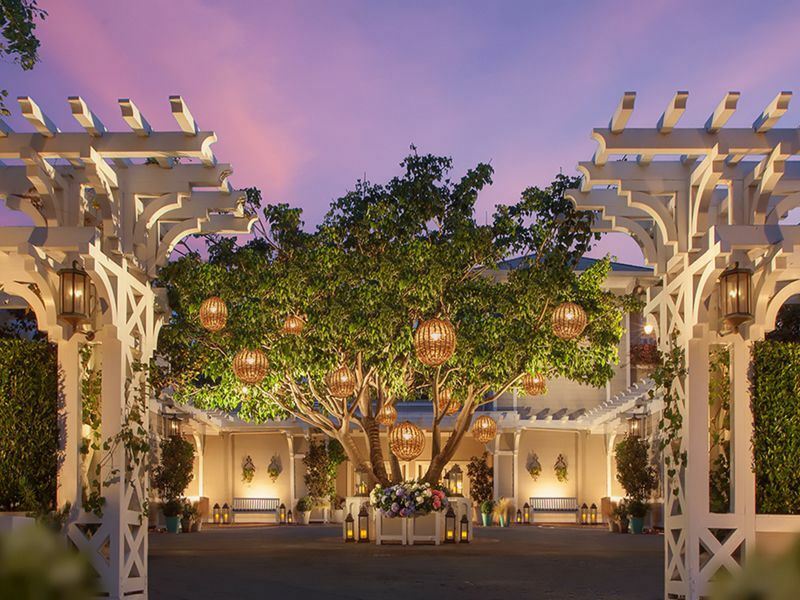 Fairmont Miramar is located on a bluff overlooking the ocean, chic rooms and garden bungalows offer a private retreat. Jump in a Jeep provided by the hotel for a lift to the Miramar Beach Club, offering private beach access for hotel guests. Kick back by the pool, relax at the spa or visit the health club. Fig Restaurant offers bistro dining using locally sourced ingredients from nearby farmers markets, while The Bungalow is a good spot for a cocktail with a sea view. What’s more it’s only a short stroll from Santa Monica Pier and the shopping areas. The boutique Viceroy has stylish rooms with a sophisticated beach theme, have a cocktail in a chic cabana overlooking the pool at happy hour, get your fitness fix during a work out on the beach with a Viceroy fitness instructor or jump on a bike courtesy of the hotel and explore the area. Loews Santa Monica has a pool looking onto the ocean with views of Santa Monica Pier, which is just right for relaxing by with a frozen Margarita. The hotel’s restaurant Ocean & Vine is a great venue to enjoy seafood and wine or for something a bit different relax by a fire pit at Blue Streak. Visit the Beach Barn by the pool for ice cream and head to Sunrise Breakfast Bar to get your morning coffee fix.